Thank you very much to one of the NHM Writers, Karen, for this fab review! Thank you also to Michelle for the pictures! 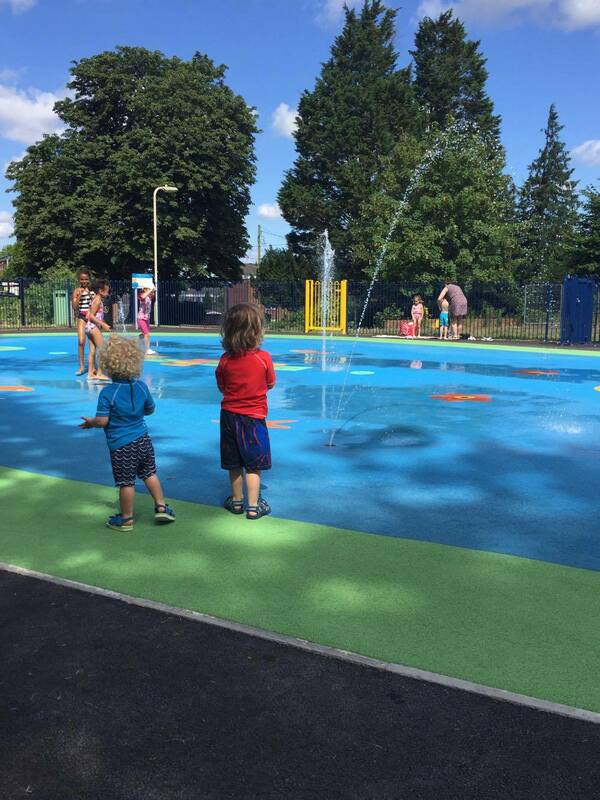 Chineham Splash Park is a new, free water activity open between 10:00 and 19:00 until september. 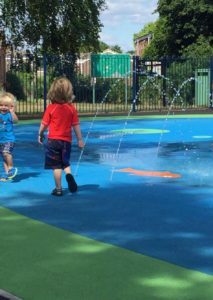 It is situated in Chineham park and also boasts a large field with a half pipe and outdoor trail gym. When we attended we arrived before 10:00 and the park was already filling up with excited children and parents with picnic blankets. Once 10:00 finally came around someone pressed the activation button and it was only moments before all the shrieking children were soaking wet and running around in the water jets. 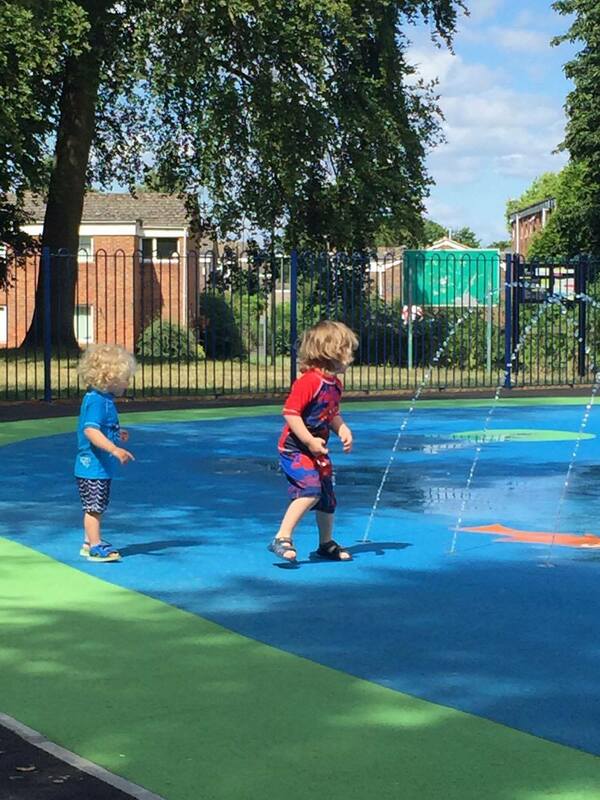 There has also been a portacabin toilet that was added to the splash park in the past week. However, the park unfortunately lacks any other facilities but the Popley Spotlight centre are happy for people to pop in and use the toilets and they also sell refreshments. Bare in mind that is a 5 minute walk away so if there’s only one adult in your group you’ll probably end up packing away your things. You might want flipflops or sandals for wet children to wear as well as extra towels or clothes to put on over wet swimming costumes for the trips to the toilets. 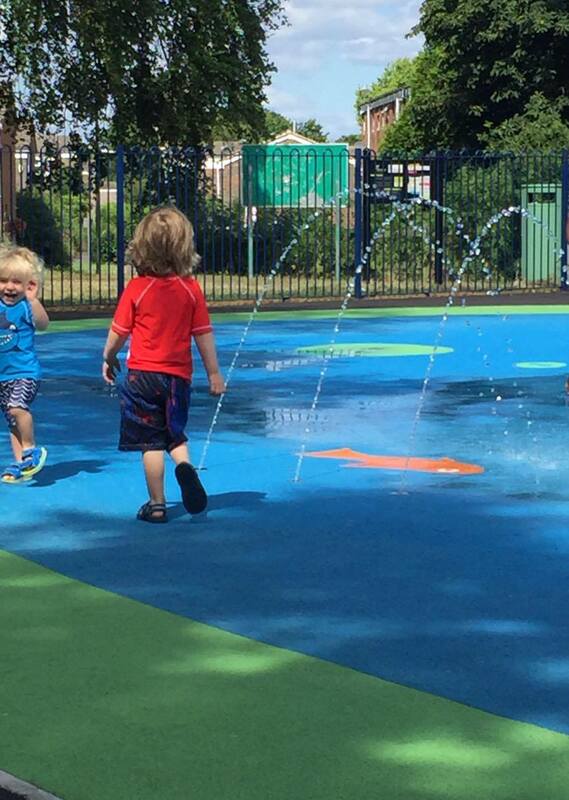 Don’t forget your swimming costumes, towels and swim nappies as well as sun protection. The area has several picnic benches but they are unshaded in the morning so bring a picnic rug or blanket and head under the trees. Our top tips are to consider bringing the buggy (or a shopping trolley) to load everything in for trips to the toilet, don’t forget your own potty to avoid a few and arrive early before it fills up. Older excited children might be a bit daunting for the little ones so bring a towel for yourself so you can encourage them in (and cool off) and a carrier if you have a baby. If the water isn’t working, don’t leave, the council advise that if its been on constantly for a long time sometimes the reservoir will need 30 minutes to refill. 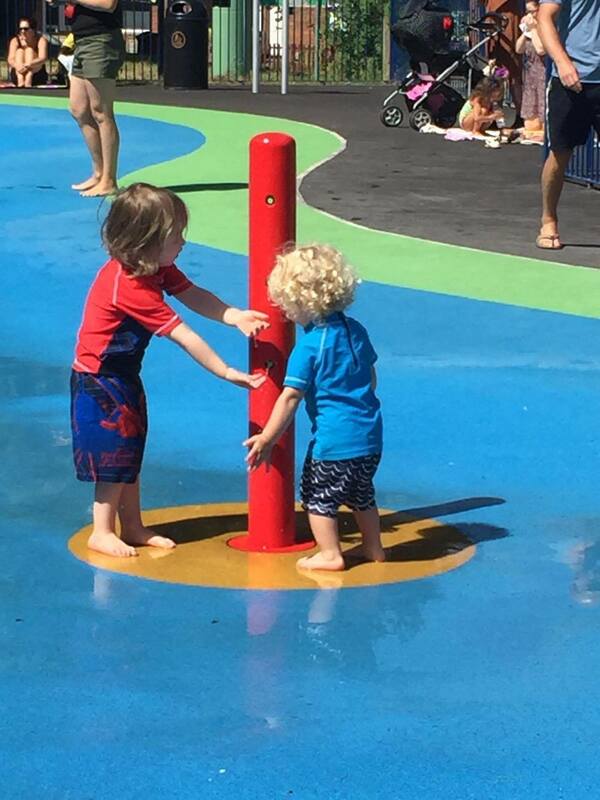 We enjoyed the splash park so it scores a 5/5 from the Johnson family. It needs to recharge every so often. If after 1/2 an hour it still isn’t working then it should be reported via the council customer services team on 01256 844844. Thanks!